The inherent simplicity of summer style can in many ways make the season that little bit harder to dress for. With a dearth of options in comparison to the autumn/winter half of our wardrobes, a shirt or tee matched with a pair of shorts is about as exciting as it gets for many of us when the mercury soars. This means it’s even more important that you get your colour combinations right. But which hues work best together? Should green really not be seen with blue? These are questions that continue to stump even the most stylish of men. This combination forms a core part of menswear’s proverbial DNA – who hasn’t at least once teamed a pair of brown shoes with a navy suit? When styling their outfits, several designers went for the same approach: brown up top, and navy on the bottom. Brown is often limited to footwear when it comes to buttoned-up style, but with a slew of designers and brands channelling the 1970s this season and next, there’s something to be said for brown tailoring. Just as versatile as navy, a brown suit is appropriate for the majority of formal events, as well as business use provided you style it correctly – we recommend teaming with a sky blue shirt and navy tie. Conversely, there’s nothing stopping you from switching things up and trying your hand at some brown legwear – controversial, we know. A navy polo shirt worn with some tan linen trousers makes for a winning smart-casual combination. If none of the above looks take your fancy, consider mixing in one colour via subtle accessories or accents. 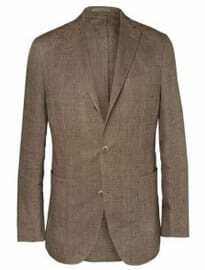 For example, a brown knitted tie with a navy double-breasted suit, or some tan loafers alongside your staple navy chinos. We clocked this particular combination much earlier in the year. Blue and green – despite that tired old adage – is a colour coupling at the forefront of menswear minds this spring/summer, as proven by London tailoring labels Gieves & Hawkes, Hackett, and Baartmans and Siegel. Savile Row brand Gieves & Hawkes took a step back from suiting and showed us how potent blue and green can be when applied to casual attire, often layering striking sea green outerwear over head-to-toe navy looks. Hackett, on the other hand, took the tailored route, teaming a shimmer green long-sleeved shirt with cobalt tailored shorts, and jungle green trousers with a navy double-breasted blazer. Baartmans and Siegel, meanwhile, opted for darker, more muted tones for a moodier effect. A standout outfit came in the form of an olive green bomber jacket and trousers combination, which was broken up by a simple navy T-shirt and finished with coordinating green Derby shoes. What we learned from these key runway examples was that blue and green are best left to themselves; both packing a considerable punch, introducing another darker hue such as black, brown or burgundy is too much. Give your summer tailoring a kick by mixing a pair of soft green trousers with a fitted navy double-breasted blazer (as seen at Hackett), using a simple light blue Oxford shirt to pull the two halves together. Take a nod from Gieves & Hawkes and layer a light green piece of outerwear over an all-navy ensemble. With strong safari connotations, this classic colour combination is not unlike nautical blue and white – a perennial warm-weather pairing that’s a breeze to wear. Whether it’s a suited and booted or slightly more dressed-down approach that you’re eager to take, designers offered up plenty of inspiration for spring/summer 2015. Contemporary tailoring connoisseur Richard James showed a series of distinctly safari-inspired looks, accessorised with desert boots and bucket hats, while Gucci’s former head of menswear Frida Giannini went for a slightly more military feel, emphasised by the inclusion of naval shirts and double-breasted trench coats. A white trousers and khaki blazer pairing is as synonymous with a summer wedding as watered-down Pimm’s and a heavily perspiring photographer (that’s very, for readers outside the UK). For a more casual take on the previous outfit, swap the blazer for a white denim jacket and switch out the smart white trousers for slim-cut chinos in beige. Arguably the easiest way to work some khaki into your wardrobe is with a timeless camel-coloured mac. These colours may be two of the cornerstones of a man’s wardrobe, but it’s only recently that we’ve started to put them together regularly. Owing to the sports luxe and athleisure trends, monochrome looks have quickly become a key fixture in men’s fashion, so it’s worth taking the time to master this striking pairing. For spring/summer 2015, Parisian labels Balmain and Givenchy both championed full black and white outfits, using the starkly contrasting hues across street- and sportswear-inspired ensembles. For many of us, the summer season doesn’t necessarily bring with it three solid months of breathtakingly good weather. So, consider shielding yourself from unseasonal showers with a sleek, lightweight hooded raincoat in black, while opting for an of the moment white-on-white T-shirt and trousers pairing underneath. 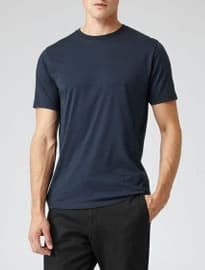 Graphic tees have begun to shrug off some of their negative connotations of late as menswear continues to move in a slightly more casual direction (though that’s not to say Ed Hardy and co. are making a comeback any time soon). When it comes to tailored looks, you can of course stick to the classic (if a little boring) pairing of a black suit and white shirt, but why not switch it up this season and opt for a white blazer? Anchored with well-cut trousers or chinos in black, a white suit jacket stays the stylish side of flashy – just avoid wearing a Saturday Night Fever-inspired black shirt underneath. 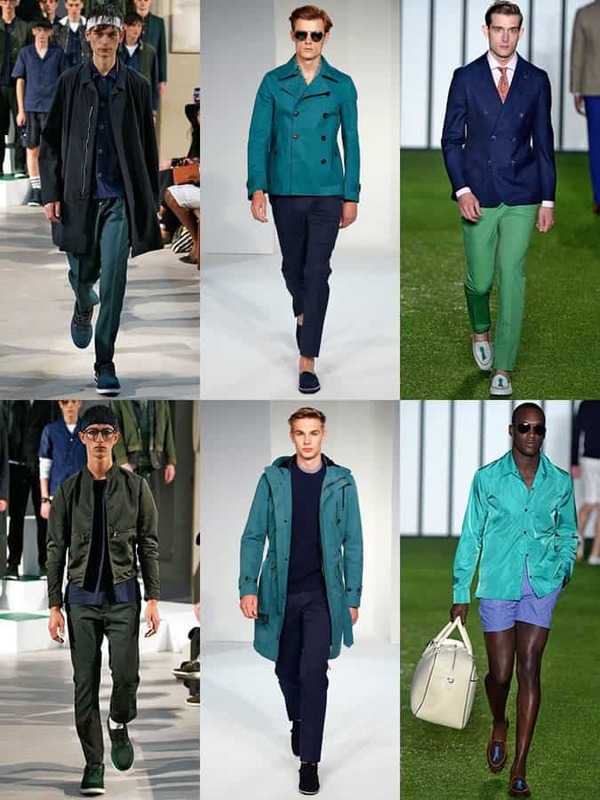 Although on-trend for SS15, every man should have the four colour combinations above in his repertoire. 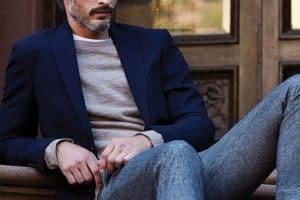 Timeless, masculine and versatile, no matter what pieces you choose to combine, they will continue to serve you well for many more years to come, enabling you to put together stylish warm-weather ensembles with very little thought and effort. Which colour pairings will be prominent in your wardrobe this season? Comment below to let us know. 6 How Much Should You Spend On A Watch?